Before summer slips away, I'd like to show you this framed paper filigree piece that was included in my quilling exhibit at the Brandywine River Museum of Art. I made it as a gift for someone who enjoys growing peas each spring, thus the choice of subject material. To be honest, I never cared too much for peas as a child, but I've certainly mended my ways. Now not only do I like to eat them, but I also admire the growing habit of the plant itself... such delicate tendrils with a surprisingly firm grasp - really quite miraculous! I enjoyed recreating that aspect in paper. 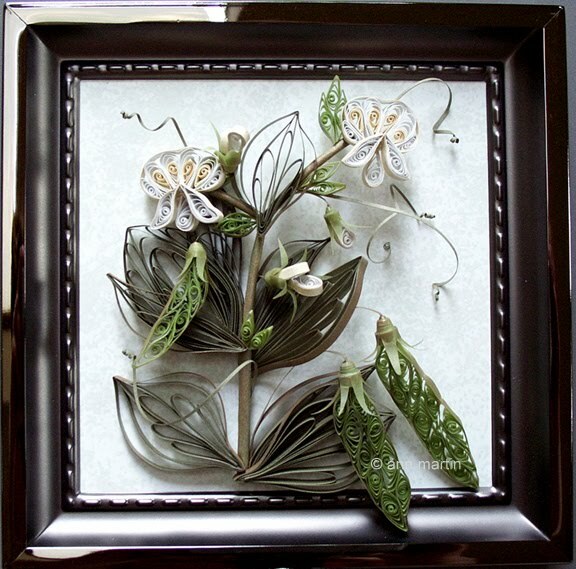 Strips of hand cut vellum were used for the pea pods, and Speck-tacular quilling paper (edit: sadly now discontinued) from Lake City Craft Company made up the majority of the plant and flowers. I find that the muted, speckled shades are a natural for plant construction and the paper is just the right weight for looping and sculpting. Very beautiful! I've seen it on NAQG site, and now can look even closer. Thanks for sharing! That is adorable! The tendrils of the plant make it a particularly good subject for quilling. I have done all my life! It makes the peas taste funny! but keeps them on the knife! So beautiful and realistic! Gentle tendrils and pods are awesome. This is really beautiful, Ann! I love the way it spills out of the frame! Paper peas are different, though - I love these! Really stunning! Very lucky recipient of this gorgeous piece!